I nose, its HARD work snoopervising in the garden and the peeps just don’t understand do they? I’d let you keep that pillow and get me a new one. You’re so precious. I also love to sleep on Mama’s pillow! It’s just the right softness! BUT you are lucky you get to be on the human’s bed – that never happens here. My ghostwriter has been waiting for a nice day to start cleaning up the yard that doesn’t happen to be a day she has to go to work. I think the yard is perfect the way it is: soggy and wet, with lots of good scents to follow, and mud to track into the house! Hope you got a good nap, Walter! on April 10, 2019 at 1:07 pm | Reply World Of Animals, Inc.
Walter, we understand how you feel. Yard work is hard on the body. We just love you have a snooze on your moms’ pillow. Thanks for the share. Have a wonderful rest of your day. You look absolutely exhausted, Walter! No way your mom should make you move. Bwahaahaa! We’re not allowed to sleep on HER pillow. Actually, SHE puts it UNDER another pillow. 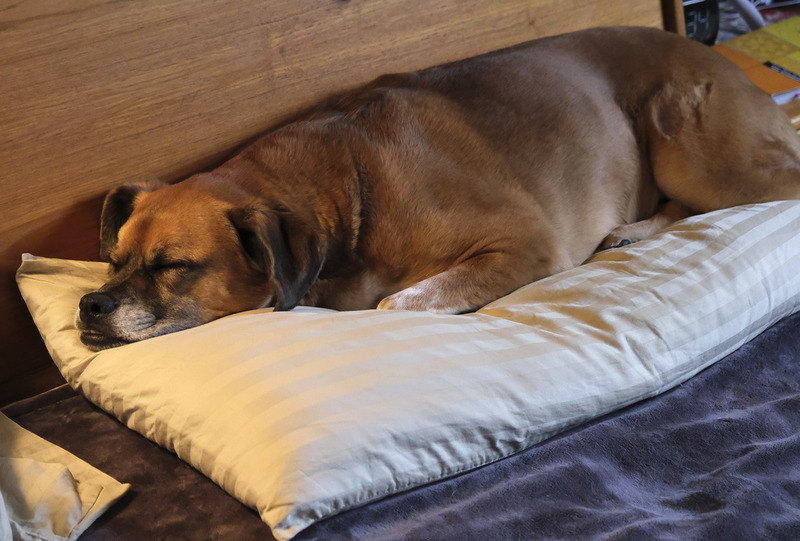 And Roxy ignores the ‘not-on-my-side-of-the-bed’ rule, so maybe the pillow will be next. Walter, we are so jealous you get to sleep on your Mom’s pillow we don’t even get to go in her bedroom. Our peeps make us move from their pillows too! We say if you were there first it is yours! You get to sleep on Mom’s pillow WOW you are really somebunny! Me I only get the foot of the bed, yep it is my jobs to keep Lee’s feet warm. I totally relate to the hardships involved in shifting position when one’s human comes to bed. I mean, aren’t pillows supposed to be bad for them anyway? Our mom and dad have been crazy-pantses, doing garage stuff, yard stuff, and fixer upper stuff. I’m exhausted!